SASPy provides Python access to all of the features that your SAS license allows. The SAS Pipefitter project extends the SASPy project by providing a high-level API for building analytical pipelines. With SAS Pipefitter, you can easily create repeatable workflows that feature advanced analytics and machine learning algorithms. In our video interview, Jared presents a cool example of a decision tree applied to the passenger survival factors on the Titanic. It's powered by PROC HPSPLIT behind the scenes, but Python users don't need to know all of that "inside baseball." The jar files are compatible between Windows and Unix, so if you find them in a Unix SAS install you can still copy them to your Python Windows client. You'll need to modify the sascgf.py file (installed with the SASPy package) to point to where you've stashed these. If using local SAS on Windows, you also need to make sure that the sspiauth.dll is in your Windows system PATH. The easiest method to add SASHOME\SASFoundation\9.4\core\sasexe to your system PATH variable. Is there a way for python to interact thru SAS Enterprise guide? That depends what you want to do. Want to invoke a Python script? You can use the System Command task (found on this blog). What did you have in mind? Do I need to have SAS licensed software to read SAS data files in python using saspy? Yes, you need to have a SAS session that SASPy can connect to. This can be local SAS or a remote SAS server with a configured connection. It's also available to try for free with SAS University Edition. How to connect to a SAS server from SASpy module? We are planning to build an user interface in python for SAS tools(to trigger stores procedures and accessing datasets for analysis). Is there any other options that I can achieve this? Note : We are accessing SAS EG thru citrix receiver. SASPy connects to SAS Workspace servers (local or using Integration Technologies). If you need to connect to a Stored Process server, it doesn't offer a method for that. However, if you're running a true SAS stored process, then you can surface that as a Web Service. Python offers standard methods for calling REST web services -- stored process authors and maybe a SAS admin will need to help set that up. You can also use the SAS Workspace and PROC STP to run stored processes from SASPy, and save the output data from there (convert to pandas, whatever you need). See the Stored Process Developer's Guide for more information on both of these methods. Thanks. That helps. I'm using IOM config to connect SAS server. I'm able to trigger components and other things. Is there any way to browse the sas server directories for selecting files and datasets in saspy (for user interface)? How to get SAS server directory tree in SASpy? Good questions. I don't know if SASPy provides access to the IOM FileService or the DataService. These are good questions to ask on the Issues board at the saspy project. On windows could I use saspy to Choose SAS session encoding such as UTF-8 rather than default wlatin1? Yes, you would need to change this in the sascfg.py (or sascfg_personal.py) -- there is an encoding field. 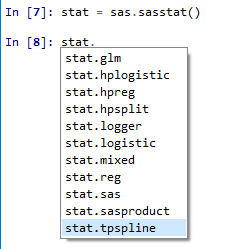 OR you may be able to change in your local SAS just by modifying the default sasv9.cfg in your SAS install to point to the nls/u8/sasv9.cfg file.